In the context of preparing an EU Action Plan against Wildlife Trafficking, the European Parliament commissioned a study to analyze wildlife crime in the EU, in particular the level and quality of enforcement in Member States. This study was compiled by a consortium led by Ecologic Institute. The study provided numerous insights on how to enhance the fight against wildlife crime. First, a higher priority should be placed on combating wildlife crime at the political level in addition to the measures taken by enforcement bodies. Secondly, Member States should provide for the specialization of enforcement staff and units. Finally, the report highlights the need for improved data collection, better cooperation and more demand reduction measures. The study was published on the European Parliament website in March 2016 and is available for download. Wildlife crime has established itself as a serious threat to biodiversity and sustainable development. The EU is both an important market for illegal wildlife products and an important actor in the fight against wildlife crime. Therefore, the European Commission has recently adopted an EU Action Plan against Wildlife Trafficking. The study was compiled by a consortium led by Ecologic Institute and comprising the Institute for European Environmental Policy (IEEP), the Institute for Environmental Studies (IVM), the University of South Wales, Ragnhild Sollund of the University of Oslo, Tanya Wyatt of the University of Northumbria and Teresa Fajardo del Castillo of the University of Granada. The study contains as first chapter an introduction to the CITES convention, which regulates the trade in endangered species, and the EU legislation on wildlife crime. This is followed by a review of academic and official literature on wildlife crime. Moreover, the report contains two chapters on illegal wildlife trade in the EU, and implementation of EU wildlife regulations and law enforcement in EU Member States respectively. These chapters are based on a review of selected official reports and statistics for 25 Member States, data from the EU-Twix database which contains data on seizures reported by the EU Member States, and an in-depth analysis including interviews for five selected Member States (Germany, the Netherlands, Poland, Spain and the United Kingdom). The overall trend in wildlife crime measured in the number of seizures has been roughly constant in recent years. Seizures are concentrated in countries with large overall trading volumes like Germany, the Netherlands, Spain, France and the United Kingdom. The most frequently seized species are reptiles, mammals, flowers and corals. On wildlife crime enforcement the study concludes that the regulatory framework is by and large sufficient for combatting illegal wildlife trade. However, insufficient and uneven levels of enforcement of the existing legislation across the EU are a major concern. What is problematic are in particular the varying and often low levels of sanctions imposed in Member States, a lack of resources, technical skills, awareness and expertise among law enforcers, prosecutors and judicial authorities, and the low priority given to wildlife crime by enforcement institutions. The study ends with conclusions and policy recommendations for the European Parliament. 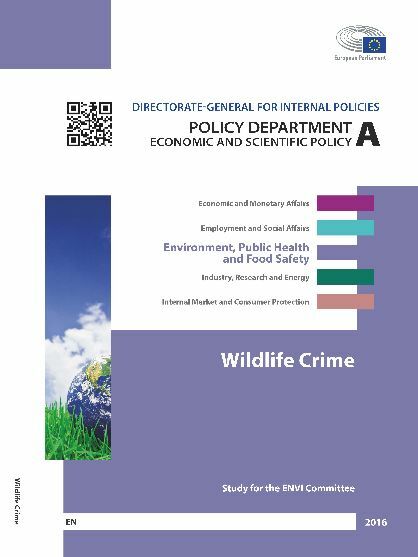 Some of these recommendations are that higher priority should be given to fighting wildlife crime at the political level as well as by enforcement bodies; Member States should provide for the specialization of enforcement staff and units. Improved data collection, better cooperation and more demand reduction measures are also recommended. Sina, Stephan; Gerstetter, Christiane; Porsch, Lucas et al. (2016): Wildlife Crime. Study for the ENVI Committee, Brussels.